for the May 4, 2019 Test. 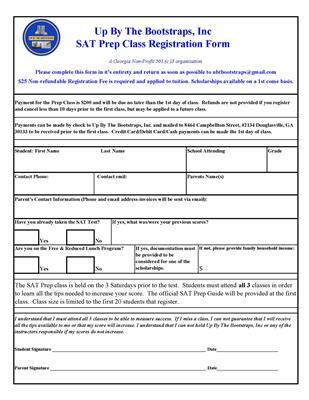 All materials including the Official SAT Prep Guide are included. Registration is required. Registration is March 8 - April 5th. Class Tuition Cost is $200 for this 9 hour session. There is a $25 registration fee that will be applied to the Class tuition. Registration ends April 5, 2019. There will be 50% scholarships being offered for this session. These will be offered on a 1st come, 1st serve basis. Students must be on Free or Reduced lunch to receive a scholarship and they must be recommended by a School Counselor or Teacher. 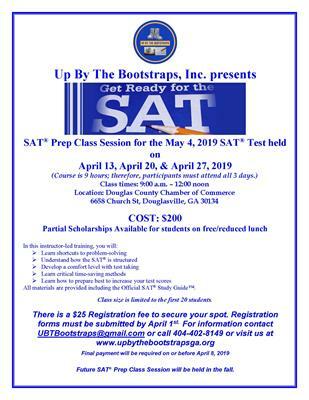 Admission is open to students at any of the 5 Douglas County High Schools with first preference to students that participate in the the Free or Reduced Lunch program.